She is one of the most beautiful fashion dolls i own. She is a very good likeness of the famous movie star Rita Hayworth, with her chiseled face and the flaming red hair cascading into lovely big curls on her back. She could be a bit taller though - her height makes her my shortest fashion doll, along with Franklin Mint's Jackie O, making it difficult to dress her elegantly. Her petite body makes it easy for her to wear most of Gene's clothing. This suits her ideally as it is clothing that belongs to her era. She is not articulated at the elbows, knees or wrists, making her difficult to pose. She has a sturdy saddle stand with her name inscribed on a raised plaque at the front. 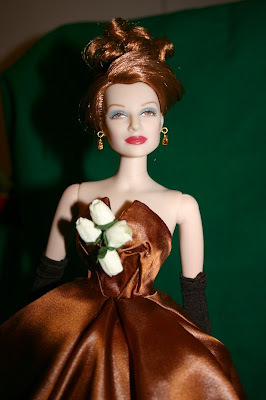 She was released in 2000 for a benefit: "Sony Pictures Consumer Products and Princess Yasmin Aga Khan (daughter of Rita Hayworth and honorary vice chair for the Alzheimer's Association)will unveil the first Rita Hayworth as Gilda(TM) collector Doll for hundreds of FAO Schwartz (New York)customers. The new line of dolls, manufactured by Simple Wishes,will launch exclusively through FAO Schwartz (SRP $150) beginning September 27. A portion of proceeds from the purchase of the doll will be donated to the Alzheimer's Association" Unfortunately the line did not continue and we were left with this doll only, which is very hard to find as it was made in a limited edition (I do not know the run of the edition, so knowledgeable people fill me in). And here she is in another of Gene's outfits called Emerald Eve. I think green suits her a lot!